Over 14 years, Mamaroneck author has visited Havana, Pinar del Rio, Santa Clara, and all kinds of places along the way. Whenever you decide to travel to Cuba, you will find the people very welcoming and friendly. Who: Kate Moody is a longtime resident of Westchester who raised her family here and has been a teacher at every level from pre-K through graduate school. Moody did groundbreaking work at Nickelodeon in the early 1980s before becoming a doctoral candidate at Teachers College Columbia University. Her work on media literacy in the Mamaroneck Public Schools has been awarded by the Center for Media Literacy in Los Angeles. 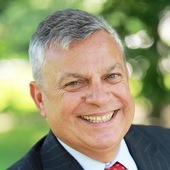 Moody wrote "Growing Up on Television" (Times Books) and later "The Children of Telstar: Early Experiments in School Television Production" (Center for Understanding Media 2000) based on a 15-year history of projects in the Mamaroneck Public Schools. She now lives in Mamaroneck with her Golden Retriever Muffy. Why I went: I began traveling to Cuba in 2002 when I went under the license of the University of Texas. I have been there 14 times to date. Across the years I have visited Havana, Pinar del Rio, Santa Clara, Remedios, Cayo Santa Maria and all kinds of places along the way. My focus has been on education systems and have therefore visited schools from pre-school to university including the famous National Art Schools, special education residences, the University of Havana, dance schools, medical schools and hospitals. The curiosity that led me to Cuba arose from the fact that Cubans outperform students in most other countries in academic subjects as well as all the arts. It seemed to me that there might be some things to learn from their long experience and unusual commitment to public education. I am currently writing a book about what I have learned about education in my travels. Although I didn’t anticipate it, this has been a period of historic diplomatic and cultural change. By coincidence, I was in Havana last December 17 when President Obama announced declaration of the two countries to restore diplomatic relations. By mid-morning there was much flag-waving and happy celebration in the streets. What to pack: I just returned on Aug. 1 from Cuba where there was a tropical heat wave. I was able to fly directly from JFK to Havana on JetBlue (two hours and 55 minutes), which made it a relatively easy trip. Would not recommend June-August for first time “norte-americano” travelers. Always think about taking summer clothes, plus good walking shoes, washable items and a HAT. I sometimes travel with a carry-on only. Where to stay: I have stayed at 5-star hotels, casa particulars (rented rooms in homes), once I slept through a tropical rain storm in a thatched hut outside of Santa Clara, but my best times were staying with my Cuban friend, Dora, and her dog, Cachita, in their apartment in the Vedado section of Havana. She helps me with translations and we stay up late talking about Cuban history and folklore. Of late, Airbnb is operating to book rooms in Cuba and is experiencing a swift business. As for hotels, The Nacional is steeped in history and overlooks the Malacon and the Straits of Florida; the Melia Cohiba is newer and has the best business center including good Internet, email and telephone connections; the Saratoga is elegant and smaller, with true elegance. (Beyonce preferred this). I have stayed at all of those. I recommend that first-time visitors join a group tour in order to include as many important sites as possible. Soon Pope Francis will be visiting Cuba and there will be no rooms at the hotels available in Havana during 23-25th of September. Dining: The larger hotels have an abundant breakfast buffet with mango, papaya, about 15 varieties of eggs to choose from and a dangerous amount of homemade breads. Most tour groups have two meals per day included. Paladars are coop restaurants that are public-private enterprises. Some are very good. Paladar La Guarida in Havana is very popular. Along the way, you may want to sample the classic Mojitos, a rum drink with Yerba Buena (mint) or a classic Cuban pork sandwich. Maybe even a cigar. It is now legal to bring Cuban cigars home. Cubans note with pride that 85% of the food produced in their country is organic. Good to know: Whenever you decide to travel to Cuba, you will find the people very welcoming and friendly. There are now American flags flying everywhere. But, as one travel writer cautioned, “Go now... before the Golden Arches appear!” Buen Viaje! If you'd like to contribute a story about your latest getaway, such as Kate Moody's trip to Cuba, please contact editor Karen Croke at kcroke1@lohud.com or 914-826-1654. Gerardo M Gonzalez does not work for, consult, own shares in or receive funding from any company or organization that would benefit from this article, and has disclosed no relevant affiliations beyond the academic appointment above. The Conversation is funded by Gordon and Betty Moore Foundation, Howard Hughes Medical Institute, Robert Wood Johnson Foundation, Alfred P Sloan Foundation and William and Flora Hewlett Foundation. Our global publishing platform is funded by Commonwealth Bank of Australia. We believe in the free flow of information. We use a Creative Commons Attribution NoDerivatives licence, so you can republish our articles for free, online or in print. The thawing of diplomatic relations between the United States and Cuba will be good for people on the island and in America – and that includes students and academics. American universities, such as Indiana University, where I serve as dean emeritus and professor of educational leadership and policy studies in the School of Education, are increasingly seeking linkages with Cubans and Cuban educational institutions. The Institute for International Education Open Doors Data show that in 2010-2011 there were 375 US students studying in Cuba. By 2012-2013, the most recent year reported, that number had grown more than fourfold to 1,633. Indiana University has a long history of engagement with developing nations including Vietnam, Macedonia, Angola, Kyrqyzstan, Indonesia, South Sudan and many others. Before the opening of China, for example, Indiana University established a partnership with Zhejiang University . Today, Zhejiang is one of China’s top 10 universities and routinely sends undergraduate and graduate students to study on our Bloomington campus. Each summer we offer a select group of undergraduate students the opportunity to spend a month learning about American culture and heritage while considering their prospects for graduate study. This experience has taught us that such partnerships are an effective way to dispel misconceptions and establish longtime, mutually beneficial partnerships. Indiana University is one of 12 American universities selected to participate in the Institute for International Education Cuba Higher Education Initiative to promote linkages with Cuba. Two other Big-Ten institutions selected are Rutgers University and the University of Nebraska-Lincoln. The goal of the program is for each participating university to develop a strategic plan for engagement with Cuban colleges and universities. The target date for completing the plans is December 2015. We will take a study tour to the island in early fall to learn about the system of higher education in Cuba, identify potential partners and begin to form relationships with Cuban counterparts. Then Indiana University hopes to start working together on research, study-abroad opportunities, student exchanges and other forms of collaboration. The road won’t be easy. Cuba’s centralized system of governance presents considerable bureaucratic hurdles. Ideological differences between the two systems will require respect for differences and high levels of cultural sensitivity. American universities have had a long tradition of academic freedom and self-governance. In Cuba, academic partnerships and research must be centrally approved. The obstacles are not insurmountable, however. Already there are signs that improved relations between the US and Cuba are accelerating social and economic reforms that would have been unthinkable just a few years ago. In May 2012 I was invited to lead a group of Indiana University alumni to Cuba as part of a people-to-people cultural exchange tour of the island. It was my first trip to Cuba since 50 years earlier, when my parents made the decision to leave everything behind to give my younger sister and me a chance for a better life than the Castro revolution promised. I was 11 years old. We arrived in the United States with the clothes we wore, US$5, and two bottles of Cuban rum. My father promptly sold the rum to get a little extra cash. America embraced us. We were given asylum, government assistance to get on our feet and the opportunity to pursue our dreams in freedom. I was apprehensive about going back to my birthplace for the first time. I still vividly recalled how, 50 years earlier, the Communist government had called us and others leaving Cuba gusanos, or worms. But the Cuban people I met were warm and welcoming. One of the first things I noticed was that everyone with whom I spoke either wanted to leave or wanted change. Many common people also were willing to speak out on the system’s flaws and call for a better way of doing things. Such openness was not what I expected to find in Cuba. During a second visit, in 2013, I attended a lecture from an economics professor from the University of Havana who spoke about the new liberalization of economic and social policies. When I asked the speaker whether he saw any contradiction between Fidel’s dictum and the current privatization policies, he didn’t have a good answer. What we are seeing is that privatization is gaining ground. During my first trip, in 2012, I met a cuentapropista. This entrepreneur had started a business selling rum mixed with guarapo, the sweet juice produced when sugarcane is squeezed through a grinder, to tourists outside the Ernest Hemingway House Museum in the outskirts of Havana. 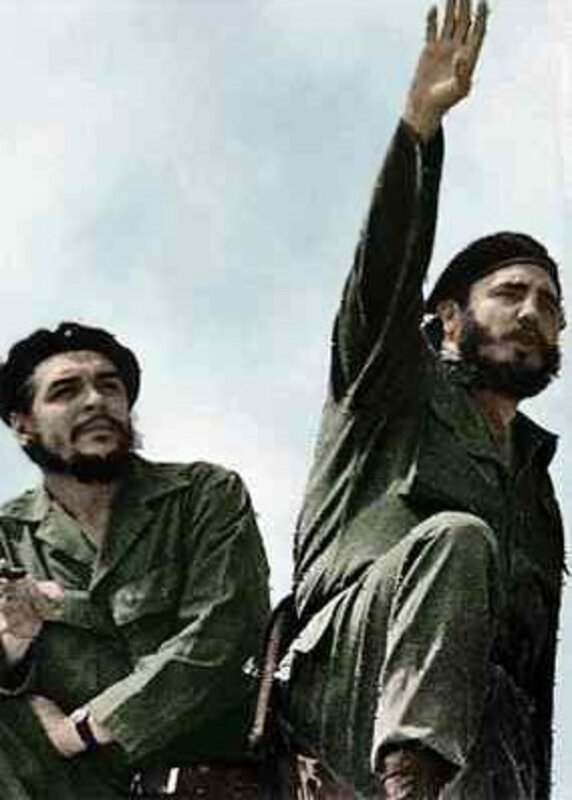 Although we did not talk politics, it was obvious that he enjoyed talking with a fellow Cuban from America. He offered me a free drink. I went to see him again in 2013 and he excitedly told me about his plans to expand his spiked guarapo business to a location outside El Morro, the iconic Spanish fort that dots the entrance to the port of Havana. At Indiana University, among other things, we’d like to explore having students in our entrepreneurship program work with Cuban cuentapropistas to develop business plans. If that happens, Cuban entrepreneurs like my guarapo-selling friend would benefit, our students would gain real-world experience, and together we would be helping to pave the way for economic and social changes needed in Cuba. That’s why the raising of the Stars and Stripes at the American Embassy in Havana will be good for the people of Cuba and for Americans. departing Havana or Montego Bay between December 18 and April 11. Cuba Cruise is the most convenient (and least expensive) way to get an introduction to the people and ambiance of four distinctive regions of the large and complex island of Cuba. Enjoy guaranteed quality transportation, meals and accommodations. Unpack and pack only once! Participants in Cuba Cruise just like travelers on more conventional ground tours are purchasing a "full-time schedule of educational exchange activities". With at least a month notice, encounters with counterparts can be arranged for special interests groups of at least 40 persons, e.g. teachers, medical practitioners, lawyers, students, artists, social workers, dancers, musicians; African Americans, Irish Americans, Chinese Americans, Hispanic Americans; Jewish, Protestant and Catholic faith communities, etc. Supplemental charges will apply. If originating in Havana, you can allow one day before embarkation and one day after disembarkation for transit without stress due to flight connections. Information is available about places to stay, both private bed and breakfasts and hotels. On board, please introduce yourself to some of the120 Cuban staff members. Most speak English and welcome a chance to exchange experiences and personal stories. We will create two structured interactions for our travelers with some of the Cubans but that is not the only chance to get to know the folks who will be part of your life for a very pleasant and meaningful week. Also plan on attending daily on board talks about Cuban history and culture. Commercial Flights by End of Year? WASHINGTON—The Obama administration is working to reach a deal with Cuba by year’s end that would allow travelers to fly on scheduled commercial flights between the countries, U.S. officials say, chipping away at a travel ban without requiring Congress to lift it. The agreement would allow airlines to establish regular service between the U.S. and Cuba as early as December, officials said, marking the most significant expansion of economic and tourism ties between the U.S. and Cuba since the 1950s, when Americans regularly traveled back and forth to Havana. The Obama administration is also exploring further steps to loosen travel restrictions for Americans to the island nation despite the decades-old congressional ban, officials said. The twin moves, which follow the formal reopening last week of the American embassy in Havana, underscore the White House’s intent to solidify one of President Barack Obama’s major foreign policy achievements by making the Cuba shift nearly impossible for a future president to reverse. Only Congress can lift the long-standing U.S. travel and trade embargoes imposed against Cuba in the 1960s following the rise of Fidel Castro to power. But Mr. Obama has executive authority to grant exceptions to them. He announced several last December—such as allowing Americans to use credit and debit cards in Cuba and expanding commercial sales and exports between the two countries—and is considering others. One way is to allow individual travelers to visit Cuba independently of a tour group, so long as they say their trip is intended to pursue cultural exchange, a practice known as “people-to-people” travel. U.S. laws authorize citizens to travel to Cuba only for specific purposes, including business trips, family visits or the people-to-people exchanges. By loosening restrictions on those authorized categories of travel, the administration in effect can chip away at the travel ban. Deepening both U.S.-Cuba economic relations and the two countries’ cultural and tourism ties is part of how Mr. Obama hopes to ensure that the move toward normalization doesn’t unravel under his successor. The White House has taken the same approach to the nuclear deal with Iran, which Congress is set to vote on next month and is likely to be implemented by Mr. Obama exercising his veto authority. The White House hopes Mr. Obama’s Iran and Cuba policies follow the same political trajectory as his health-care law. The idea, administration officials have said, is that like the health-care law, the Iran and Cuba initiatives will become so embedded in American policy over Mr. Obama’s final 18 months in office that undoing them would be too difficult. The president’s policies on Cuba and Iran have been widely criticized by Republican candidates running to replace him, while most Democratic contenders, including former Secretary of State Hillary Clinton, support them. “In the eyes of Barack Obama and Hillary Clinton, his former secretary of State, the Cuban people are suffering because not enough American tourists visit the country, when the truth is the Cuban people are suffering because they live in a tyrannical dictatorship,” said Sen. Marco Rubio (R., Fla.) in a speech in New York last week. Other opponents say increasing American travel to the island would primarily benefit Cuba’s military and intelligence services. “Tourism to Cuba’s regime is what oil is to Iran,” said Mauricio Claver-Carone, a director of the pro-embargo U. S-Cuba Democracy PAC, on Monday. Mr. Obama hopes that the re-establishment of U.S. relations with Cuba becomes so integral to American travelers and business leaders that it would be too politically risky for any president to revoke. That, in part, relies on expanding Americans’ access to the island nation. At the same time, the White House is working to establish a bipartisan coalition to dismantle the U.S. embargo on Cuba, at least piece by piece—starting with the travel ban. Travel from the U.S. to Cuba is up 35% since January, Secretary of State John Kerry said in Havana last week at a flag-raising ceremony at the U.S. Embassy. He told reporters Friday that he and his Cuban counterpart, Bruno Rodríguez, discussed further steps the U.S. could take to loosen travel and trade restrictions but cautioned that fully lifting the embargo would require Cuba to address human-rights concerns. Sens. Jeff Flake (R., Ariz.) and Patrick Leahy (D., Vt.), who support Mr. Obama’s Cuba policy and have introduced a bill to lift the travel ban, are among supporters who want the administration do more to loosen restrictions on travel to the island nation. For decades, U.S. citizens with an authorized purpose to visit Cuba have generally taken charter flights that are allowed under an informal arrangement between the U.S. and Cuba. The two countries now are working toward a similar arrangement to allow scheduled air service, which would enable authorized travelers to book flights to Cuba via U.S. airline websites or even travel sites such as Expedia.com. The Obama administration’s revised rules on travel and commerce in Cuba lifted restrictions on scheduled air service between the two countries. When those rules were implemented in January, the Transportation Department issued a notice that it planned to engage the Cuban government on resuming scheduled flights. The new rules issued in January also eliminated the need for many authorized travelers to obtain prior U.S. approval, essentially letting them travel to Cuba on the honor system. U.S. citizens still need a Cuban visa to enter the country. Still, traveling to Cuba for a cultural exchange—one of the 12 authorized purposes—requires going with a tour group. Proponents of expanded travel want Mr. Obama to allow individuals to travel alone to Cuba for “people-to-people” ties, or cultural exchanges. Administration officials said Monday they are considering further steps to loosen travel and trade restrictions, but wouldn’t specify which were most likely. In March, U.S. officials met with a handful of Cuban diplomats in Washington, where they agreed—through translators—that their countries’ 1953 “air transport agreement” was outdated, according to the State and Transportation Department officials. The U.S. officials proposed basic parameters for a new arrangement, including that any U.S. airline could serve Cuba as much as it wishes, one official said. The Cubans said they would get back to the Americans. Last week, the Cuban government sent the U.S. negotiators a lengthy counterproposal in Spanish and a request to soon meet again, this time in Havana, one official said. The negotiations are partly centering on how many flights a day would be permitted between the two countries and whether Cuba’s state-owned airline, Cubana de Aviación, can serve the U.S. The officials were doubtful U.S. laws would allow Cubana to fly to the U.S. Many U.S. airlines, including American Airlines Group Inc. AAL 2.50 % and JetBlue Airways Corp. JBLU 1.67 % , are eager to serve Cuba and have been pushing regulators to enable schedule service. Indeed, some carriers have already served the island for years by operating flights on behalf of charter companies. 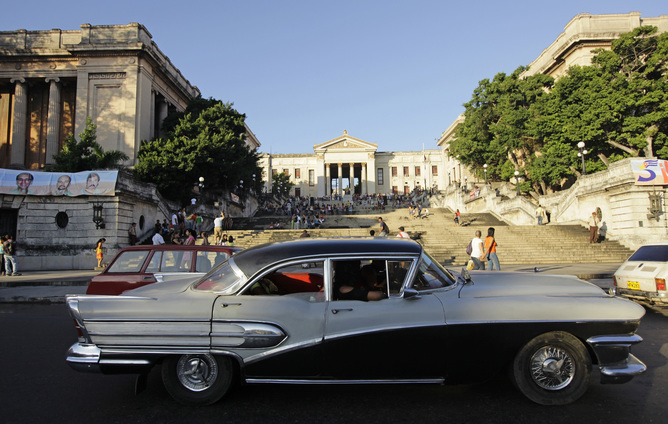 American said it expects to operate 1,200 charter flights to Cuba this year, a 9% increase from 2014. On Tuesday, American plans to announce a charter from Los Angeles to Havana, its first Cuba service from the West Cost. “We’ve absolutely seen more demand,” said Howard Kass, American’s vice president of regulatory affairs. Tara Russell, president of Fathom and global impact leader for Carnival Corp.
By next spring, Carnival Corp. hopes to be doing business in Cuba. Earlier this summer, the U.S. government approved Carnival’s Fathom cruise brand to offer trips to Cuba. In order to comply with U.S. travel restrictions, the trips have to fall under the 12 categories of authorized travel, such as humanitarian projects, people-to-people exchanges or education activities. The Fathom brand is Carnival’s newest brand concentrating on “social impact” cruises. If it gets the Cuban OK, it would become the first U.S.-based cruise ship operator to sail to the island since the trade embargo was put in place. Plans call for it to sail from Miami to Cuba every other week beginning in May. Q. What attracted Fathom to the Cuba opportunity? A: We were deeply engaged [and] immersed in building out social-impact experiences in the Dominican Republic well before the eased [U.S.] travel restrictions [to Cuba] in December of 2014. So when we got the word that some of those travel restrictions have been eased, it was natural for us to consider, [would] there be a possibility for us to serve the Cuban market and travelers hungry to go in in a differentiated way? It made sense. Q. What was the process like for the American license that was granted from the U.S. Treasury and Commerce departments? A: We have been involved in that process over the last few months. It’s a process that is a submission to the Department of Treasury and to Commerce, and we’ve worked closely with OFAC (Office of Foreign Assets Control). There’s a tremendous amount of information on the U.S. approval side that you have to be able to submit demonstrating really that you’re in alignment with those 12 authorized forms of travel. Because Fathom is a social-impact brand and it’s all about cultural immersion and education, it was really well-aligned. It was natural. It is who we are at Fathom. That process has been a back-and-forth. They have additional questions and wanted to get additional understanding. They needed to understand the ship that we were considering from a technical and ports specification standpoint. We’re really fortunate because the Adonia, the ship that we’ve purposed to Fathom in the Caribbean, is a small ship. It has about 710-passenger capacity. It’s really an intimate on-board experience for travelers and a great education vehicle. Purposely, it doesn’t have a casino. It doesn’t have Broadway entertainment. It’s a very different type of ship. It fits and maneuvers well into lots of different locations. Cuba has 11 ports of promise. We imagine and desire to visit at least three ports during the seven-day trip itineraries that we will be taking to Cuba. It’s a little bit different than what we’re doing in the Dominican Republic, because in Cuba, it’s a cultural immersion. It’s an education process. It’s really just the beginning of what we believe will be a beautiful and very lasting friendship. We have a lot of work to do in Cuba. We want to really hear from the Cuban side [about] what is it that they are prioritizing as needs and opportunities, and then as we learn those things we’re happy to explore the potential to come alongside. Q: Fathom has the American OK. You don’t have the Cuban OK. How confident are you that Carnival and the Fathom brand will be successful in getting the approval that Fathom and Carnival would like to be able to land a ship in Cuba in the spring of 2016? A. That’s an important differentiation right because at this point we’ve been the first to be granted U.S. approval. We have not yet been granted Cuban approval. That said, we’re in process. We’re in active discussions, and we’re very confident that we will gain those approvals in the coming weeks. We’ll be communicating that information so it’s important to know that the Cuban officials and authorities still have to approve everything that we’ve lined out. So we don’t want to be presumptuous. It’s really important to us that we respect and understand their desires, and, of course, we’re going to comply with their needs and make this happen. Q: You expect to be granted [Cuban approval] within a matter of weeks, not months or even years? A: The reality is we just don’t know. There is uncertainty, of course, and yet we’re obviously rapidly engaged in those discussions, and we look forward to hearing in the coming weeks [and] in the coming couple months. Q: But have you heard back from the Cuban government about your application? Is an application similar to the United States’? A: We have been in active discussions. It’s a very different process. Q: The chief of the Cuban Interest Section in Washington, D.C., had a comment regarding doing business with Cuba back in May when the Treasury Department first announced licenses for passenger ferries. He said at a legal conference, “These companies have to go to our authorities, they have to introduce their ideas.” Has Fathom and Carnival done that? A: We’re doing the same thing. We are working with Cuban authorities. They’re aware of the idea, and the conversations have been active. We expect to be furthering those rapidly now that we just received the U.S. approval. We were already engaged in active discussions [before receiving the U.S. approval]. We have 10 global brands, so some of our brands visited Cuba before and actually have a history and relationship with the Cuban government. Obviously, some of those things are long past, but we’re going to work to understand and learn as much and as quickly as possible. We’re going to continue the active discussions that we’re having there, with that back-and-forth with the Cuban government. Q: What does Carnival and Fathom need to have as part of those discussions for your brand to have a successful launch and a successful business? A: We’re going to find out. It’s very, very important to us that we understand the expectations from the Cuban officials and from the Cuban people. We absolutely envision this as a way to create cultural exchange between Americans and global travelers [and] also of the Cuban people. We’re excited about that dialogue and really the beautiful friendship that’s going to begin. There are 12 authorized forms of travel. There are people-to-people programs happening today. There are lots of providers who provide people-to-people opportunities on the ground in Cuba, and so I imagine that we will be working closely with many of those providers. We also will be developing those types of opportunities ourselves over time. Q: What about the infrastructure that’s necessary to be able to have a 710-passenger ship dock safely? A: With the Adonia, [it’s] a small ship that can maneuver lots of different locations. We also have tenders. [They] allow us to approach ports and shore sites that others may not be able to approach. We’re a company with years and years of experience navigating very different port arenas. At this point, we are confident that that is technically feasible. Q: Have you been able to do infrastructure examination in Cuba? A: In the past months, we’ve been working closely to understand the technical specifications, [also] the accommodations. Taking the volume of accommodations for 710 passengers in some ways just eases what’s needed on the ground. Q: In terms of the passengers being able to eat and sleep on the ship. A: Yes. [Passengers] have the ability to eat and sleep on the ship. So as there are more travelers visiting Cuba, and as there are limited infrastructures on the ground, this is a way for Cuba to be able to provide even more people a great opportunity to experience the country. Q: It provides ammunition for some critics about the engagement with Cuba to say a company like Carnival that has a floating hotel isn’t really providing a whole lot of economic engagement with Cuba because the passengers are not sleeping in hotels. They’re not eating necessarily in restaurants. They are just doing this cultural exchange with limited economic impact. A: As you can imagine, there are always critics who are going to say things. My encouragement to them is to get to know us, have an experience with us. [In accordance with] the people-to-people guidelines, travelers have to spend eight hours a day in allowable authorized activities that include meals on the ground in Cuba. That includes small-business interaction. So from an economic development standpoint, there is no question that the impact that we will have will be incredibly favorable and positive for the Cuban people. And yet, the accommodation obviously is going to happen on board the ship. I think until someone truly knows and understands the travel experience that we’ve developed, and until they understand the intent and ethos of our company and our corporation, [they can’t] make their decision. Q: Are there conditions that Carnival would not accept [from] the Cuban government? A: We don’t foresee a situation that even gets to that. We are in very good, positive, active discussions, and we look forward to working together and understanding from the Cuban side what we need to do to be successful together. Q: One of the chief critics of engagement has been Sen. Marco Rubio, who is running for the presidential nomination of the Republican Party. He wrote in a New York Times opinion piece, “When we make engagement with the odious leaders of these countries, our foreign policy, we make a Faustian bargain that is contrary to our national values and also to our strategic interests.” Is this Carnival’s effort against U.S. national values? A: It’s clearly an emotional and heated topic. It’s hard to understand and imagine from those Cuban-American families that have a deep history and pain, the challenges that have happened. So we empathize a lot with the complexity. Yet we still look at the beauty of the Cuban people and the opportunities that we have if we join hands together and explore developing economic development, as well as cultural exchanges that will ultimately benefit the country and the Cuban people. Q: The criticism goes beyond Rubio. Former Gov. Jeb Bush, who is also running for the GOP nomination, has spoken out against the Obama administration’s engagement efforts. They point out that while people-to-people exchanges may be culturally beneficial, ultimately the way the Cuban economy works, the money winds up in the hands of the Castro regime. What is Carnival and Fathom looking for in terms of your on-the-ground partners to assure that that risk is reduced, if not eliminated? A: I think that we’re all [in] early days in terms of a new relationship with Cuba. I think just by the news that we’ve received from [President Barack] Obama in the last couple weeks with the opening of embassies, there are clearly very active discussions happening between the two countries. Our hope and intent and spirit are to continue to build favorable relationships with the Cuban people. And with Cuban authorities. I think we’re all looking forward to a different era because the era that we’ve been through has not necessarily solved any of the challenges between the countries. Q: Perhaps it gets down to how Fathom and Carnival are going to select the partners that it works with on the ground for these people-to-people exchanges. What kind of criteria do you have? What kind of protections or red flags will you be looking for to assure that the business relationship that you’re getting into is one that is more of an enterprise relationship as opposed to a regime relationship? A: It’s a great question. We have spent a tremendous amount of time building the social-impact partnerships on the ground in the Dominican Republic, our first country, and so it’s just going to take some time. We have so much to learn in Cuba. We have so much to learn from those partners who’ve already been successfully operating on the ground. What we’re really focused on right now is education, immersion [and] understanding. It’s too soon to say exactly what our partnerships in Cuba will look like. Our partners on the ground in the Dominican Republic have 30-plus years of experience offering social-impact programs at scale. One of them works in both the Dominican Republic and Cuba [and] has more than 10 years’ experience doing micro-enterprise development in Cuba. We look for trusted partners with credible history. We look for people who have demonstrated results. We also work to engage lots of different stakeholders so we’re not just hearing from one opinion. We believe in “show” versus “tell.” So as much as we can sit here and talk about it, we’re trying to do the right thing. I think if you look at the people in our organization in terms of whom we’ve assembled to do this, it’s a pretty remarkable group of talent. Q: How are you going about navigating the difficulties of those on-the-ground partners in an environment that Cuba presents, which is much different than the Dominican Republic and much different than other places in the Caribbean for political, cultural and economic reasons? The Human Rights Watch continues criticizing the Cuban government for stepping up arrests of political prisoners and others. And here comes a big United States Fortune 500 company looking to do people-to-people exchanges in a nation that continues to be on the list of places with the worst record of human rights. A: I think it’s easy to dehumanize the country and not look directly at the people. There’s a lot of question and debate about what’s the right way to approach this new partnership and relationship with a new country. But, again, for me, it comes back to the humans and to the Cuban people. When there is opposition to engagement [with] Cuba, that’s really opposition to the Cuban people. What we hope to do is [to] bring a very human experience between the two countries. We know that often, many things happen through dialogue and a relationship. We’re going to continue to work to build genuine holistic relationships. We’re going to continue and invest in improving relationships and opportunities for our travelers [and] also for Cubans. Q: Will this require capital investment on the part of Carnival and Fathom into Cuba? A: We don’t know yet what investment potential is necessary to both get this going and long-term. Q: Are you prepared to make a capital investment? A: I think it’s too soon to say. We’re going to understand from the Cuban side what it is that they want to see to comply with their expectations and regulations to make this happen. We’re going to be open-minded about the possibilities. We’re confident we’re going to get to a solution together. Personal: 38, married, mother of two young children. Current role: President of Fathom, a social-impact company that offers a new category of travel, and global impact lead of Carnival Corporation & plc, the world’s largest travel and leisure company. Career: Russell has diverse consumer product experience with Fortune 500 companies including GM, Intel and Nike, working across product development, technical sales and marketing, process engineering and manufacturing teams. She is a serial entrepreneur with experience developing, launching and building impact businesses. Over the past 15 years, she has been building non-profit and for-profit social enterprises. In Idaho, she founded and currently is chairman of Create Common Good, a food production and job-training model for refugees, women at risk, the homeless, people coming out of prison, anyone with a barrier to employment. Under her leadership, 90 percent of the people they have served have been placed in sustainable jobs, generating nearly $20 million in wages for people they have served. In her previous life, she lived in Thailand for four years offering pro bono small business development training to nongovernmental organizations, and she also co-founded three other social ventures for profit and non-profit: Jitasa, Nightlight and World Economic Forum Global Shapers Idaho. Education: Bachelor of science in mechanical engineering with highest honors from the Georgia Institute of Technology. About Fathom: Fathom, a new brand in the Carnival Corporation family and the pioneer of impact travel, provides the opportunity to build community with like-minded travelers, become immersed in another culture, and work alongside its people as they tackle community needs and create enduring social impact. Sailing aboard the MV Adonia, a 710-passenger vessel redeployed from Carnival Corporation’s P&O Cruises (UK), Fathom will mobilize, educate and equip up to 700 travelers on every trip, allowing for thousands of impact activity days per week. See video: Go to MiamiHerald.com. MSC Cruises, the world’s largest privately-owned global cruise line and the market leader in the Mediterranean and South America, announced today that, starting in December 2015, its 2,120-guest MSC Opera will homeport in Havana for the winter 2015-16 season to offer guests 16 Caribbean cruises of relaxation and discovery. MSC Cruises will give cruise travellers from around the world a unique chance to get aboard the completely renovated 65,542 GRT MSC Opera, part of the Company’s €200 million Renaissance programme, and cruise to Jamaica, the Cayman Islands and Mexico with two nights and two and a half days in the Cuban capital. The seven-night cruises will be available to MSC Cruises travellers with a combination of packages. In particular, from Spain, Italy, France and Germany, as well as Canada, Brazil and Argentina these will include of fly and cruise combinations. The Company is also pleased to announce that the opening of the sales across all channels for cruises on MSC Opera will be on Thursday 9 July. To offer local ground services and shore excursions MSC Cruises will partner with Cubanacan, the Cuba-based group created more than 20 years ago known for its experienced professionals and high quality of service. The first cruise will start from Havana on 22 December 2015, following MSC Opera’s Grand Voyage to Cuba from Genoa, departing on 2 December 2015. To ensure that guests can enjoy and discover the capital city, the Grand Voyage will include a call in Havana on 18 December, and resume its itinerary in the region before heading back to Cuba for its final call of the journey on 22 December. On 12 April 2016, the ship will leave Havana for a Grand Voyage back to Europe, with Warnemünde (Germany) as its final destination, arriving on 7 May 2016. During their two-and-a-half-day stay in Havana, MSC Opera’s guests can explore the city’s stunning old centre, a UNESCO World Heritage Site, and discover its history, culture and architecture. No visit to Havana is complete without a stroll along the famous Malecónseafront promenade, where the island’s renowned laid-back lifestyle is in full effect. The island of Cozumel, on Mexico’s Yucatan Peninsula, offers some truly spectacular Mayan ruins, at Tulum. Travellers can snorkel with sea turtles and bathe in refreshing cavern waters, explore ancient Mayan caves or bask in the natural beauty of this island, which lies just off the coast of Quintana Roo. In Montego Bay, on the north-western coast of Jamaica, guests can go white-water rafting in the Martha Brae River, tour an old plantation at the Good Hope Estate or learn about the mysteries of Rose Hall Great House – a fascinating colonial relic imbued with rumour and intrigue. In Georgetown, the Cayman Islands, guests can snorkel in Stingray City, take a catamaran cruise to the coral reefs or just unwind on the pristine white Seven Mile Beach, on Grand Cayman’s western shore, famed for its gorgeous cobalt waters and coral sands. As part of the €5.1 billion investment plan announced in 2014, MSC Cruises had earmarked €200 million to fully renovate and modernize - through a cutting-edge full renovation project named “Renaissance programme” - four of its existing ships: MSC Armonia, MSC Sinfonia, MSC Lirica and now Havana-bound MSC Opera which is currently in dry-dock and expected to return to service early July 2015. In connection with the deployment to Cuba, MSC Opera’s original winter 2015-16 schedule in the Canary Islands, Madeira and Morocco has been cancelled.